Click Here if you would like to view information about each type of Advertisement. Fill out the form below if you would like to advertise on Springer Spaniel.com. Email us at Advertising@SpringerSpaniel.com with any questions or comments. Maximum of 5 Advertisers! Advertiser's Ad will rotate with the other five advertiser's ads. Advertisement will be placed as a 450x60 px banner located at the top of the SpringerSpaniel.com homepage. These banners will be viewed by more than 40,000 unique visitors each year! Maximum of 10 Advertisers! Advertiser's Ad will be listed on the far right column of the homepage. Ads will be listed in order of Sign Ups, with the first Sign Ups listed on top. Sign Up Now to get a prime location! Unlimited Number of Advertisers! 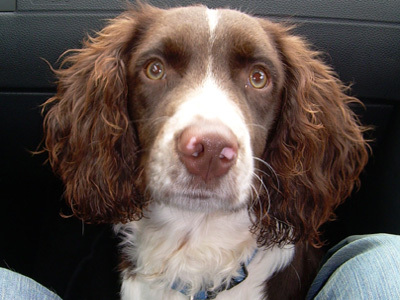 A 450x60 px banner Ad will be displayed on all of SpringerSpaniel.com's webpages, except for the homepage. One banner will be displayed at a time on each page. Every time a page is loaded, a new banner will be displayed. Unlimited Number of Advertisers! For Breeders Only. Have your breeder listed on our Breeder's Page. Breeders are listed alphabetically by state. You will be listed on the master list and also on your state list. Your Breeder name, e-mail address, website(if you don't have one, we can make one for you on our site for an additional $50), phone number, and a brief statement about your kennel. For those of you who do not run a kennel with many dogs, we offer you the option to sell up to a litter's worth of dogs through our "For Sale" page. You can either place an add on our front page for a week at a time, or you can place an ad on our "For Sale" page for a month at a time.